Basing on introducing foreign advanced technology of the same kind of equipments, according to the request and fact of home filling equipments, our company designs and develops CFGNYZ-80A automatic tube filling and sealing machine. 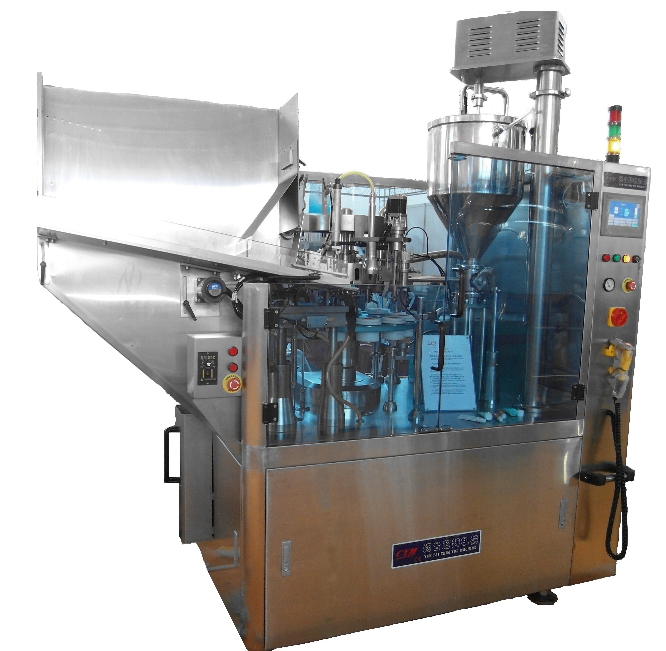 The machine has novel design, compact structure, multi-function and easy operation in order to meet the needs of domestic and international users in pharmaceutical, food and chemical industries, so it is an ideal tube filling equipment. The equipment has 40L funnel, which can control the filling part, successfully pour mushy, cream and mucous material into the tube, then complete filling, printing and sealing for plastics and lamination packing through heat seal and automatically complete the filling procedure. The machine could also be used for metal tubes after change the changes parts. Automatically tube supply tubes to working position. Automatically eye mark checking, eye mark matching and positioning equipment. Inner tube auto-cleaning and dust collecting device. Air blowing to clean the dust in the tube, and vacuum fan will collect it to callback equipment. Omron upside down testing photoelectric cell can accuracy test upside down tube and auto-control stop of tube feeding, when eliminating the up side down tube(orientation error), restart tube feeding. Controlled by precision photoelectric system, start filling action when there is tube in the working position. Product filling by blowing off and cutting off to ensure better filling for high viscosity products. Precision cooperating filling system and reasonable blowing off and cutting off design ensure filling precision. Its’ easy to assemble and dissemble, and it easy to clean completely.